Johannesburg, 16 October 2018 – According to recent statistics, South Africa produces 10 million tonnes of food waste every year and our country reportedly has the largest proportion of food wastage in Africa. 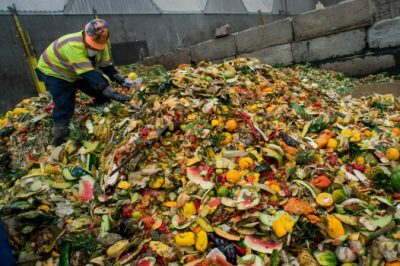 That is food that is produced but never consumed and ends up in landfills, including fruits, vegetables and cereals which alone account for 70% of this waste. Yet, an average of 12 million people – almost a quarter of the country’s population – go to bed hungry every night. Kate Stubbs, Director of Business Development and Marketing at Interwaste, believes this is a travesty and shares her views on how alternative strategies to managing food waste should be investigated. World Food Day is commemorated globally on the 16th of October – aimed at driving awareness of, and promoting action to address, world hunger. “The theme this year of, ‘our actions are our future’, encapsulates the message perfectly. It is only through understanding that we as the people in our country and of the world – and across all spheres of Government, industry and society – have a shared interest and a role to play, in both managing food waste appropriately, but also importantly to change our attitudes and behaviours to respect food,” says Stubbs. • Create awareness of the negative impacts of food waste on society, the economy and the environment. • The majority of food waste occurs early in the supply chain so by planning more effectively and improving processes could have a significant impact on avoiding or at least, minimizing this waste. • Separate food and organic waste from other waste to avoid the contamination of any recyclable waste. Convert food waste into biogas which is a renewable and sustainable source of energy. • Compost all kitchen and garden scrap by having a bin dedicated to store all recycled food waste. Composting food waste is eco-friendly, and arrangements may be made with recycling centres to collect these from you. • Keep a grocery list for ingredients needed- Shopping lists should be based on monthly or even weekly meal planning.